Child abuse in Canada is an act that is unfortunately all too common. It is not biased; it is prevalent in all races and cultures. While over a hundred thousand cases are reported annually, the actual number of cases is very hard to determine because an estimated ninety percent of instances go unreported. This information is haunting because it is almost impossible to provide help for those who do not make the issue aware to others. Oftentimes, it is presumed that this material is related to the fact that four out of five victims know their assaulters (1). Not only is there inequality in the very act of abuse, there is also inequality in who is investigated. Trocme and McPhee have found that black families have a higher chance of being investigated due to suspicions of abuse, while natives have a higher chance of neglect (2). Click on image to see the source. It is easy to see in society that inequality exists by both age and gender. When people think of violence within the home, they more often than not think of domestic violence as spousal abuse. However, this is not the most widespread form of abuse. Child abuse is, and it stems from the great disparity in both literal and figurative power. Another common misconception is that one gender tends to be more violent toward their child than the other, but in reality, mothers and fathers are equally prone to use violence. Duffy and Momirov argue, however, it is for differing reasons. (3) While men abuse their children to validate their power, women do so due to their lack of power anywhere else. Therefore, child abuse is a product of the inequality between parent and child. 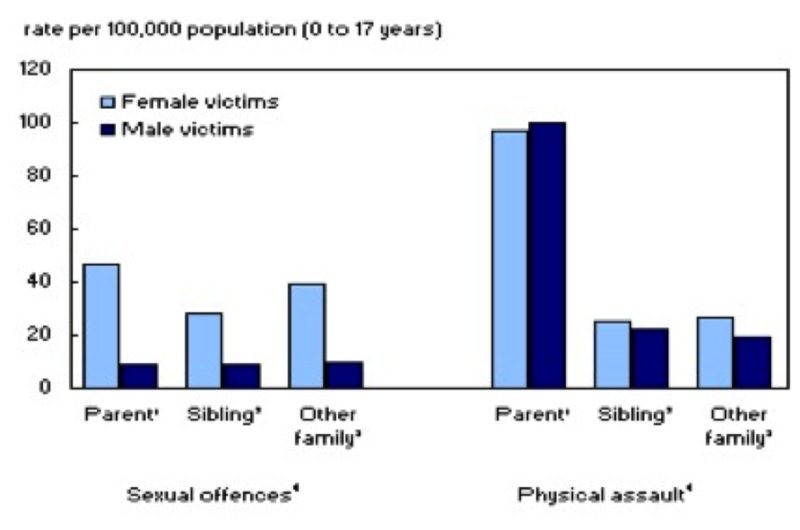 Source: Statistics Canada, Family violence in Canada. The above graph reveals two things: girls are both more sexually abused than boys and their assailants are typically parents or other family members. Boys are slightly more likely to be physically abused by their parents, but less likely by their siblings and other family members. This information is interesting because within our culture, there is a strong taboo against assaulting females but the graph suggests that they are equally likely to be ill-treated. 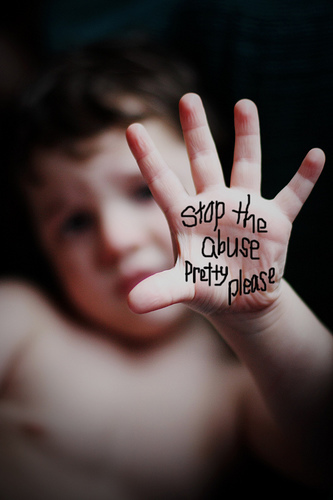 Child abuse oftentimes stays with the victim throughout their youth and into their adult life. A study by Sansone, Leung & Widerman examined the relationship between abuse and social/professional life in adulthood and revealed that out of 328 “participants,” approximately two thirds of the people studied had suffered some kind of abuse as a child. In turn, adverse affects of child abuse affect the future and how those individuals will operate in society and unintentionally perpetuate a cycle of inequality because the impact continues long after the abuse has ended. (4) Many of these “low mental health outcomes” have been identified by ASCA (Adults Surviving Child Abuse), they range from anxiety to self-harming behaviors (5). (1) Safe Horizon. “Child Abuse: Statistics & Facts.” Nov. 23, 2012. Characteristics.” Child Welfare 74, no. 3 (June 1995): 563–586. (3) Duffy, Ann, and Julianne Momirov. Family Violence: A Canadian Introduction. James Lorimer & Company, 2011. (4) Sansone, Randy A., J. Leung, & E Wiederman. “Five forms of childhood trauma: Relationships with employment in adulthood.” Child Abuse & Neglect, 39, 9, 676-9. (5) Adults Surviving Child Abuse. “Impact of Child Abuse.” Nov. 21, 2012. “Child Abuse Symptoms, Causes, Treatment – Are Girls More Often Abused Than Boys? on MedicineNet.” MedicineNet. Nov. 23, 2012. Statistics Canada. “Family Violence in Canada: A Statistical Profile.” Publication date January, 2011.